May the blessings of the New Year (and The Force) be with you. Why is Manwolf so LOUD? Lately Linda and I have been getting a number of inquiries as to why either, 1) I'm so loud on the BlogTalkRadio broadcasts, or 2) she's so soft. No, for you conspiracy theorists, I'm not trying to overshadow her in the show. Coincidentally, at the same time, a new problem cropped up when our former archive host crashed, taking our entire library of shows down with them. (Most of those shows are still unavailable.) We did, however, find a new venue to host the archives -- Blog Talk Radio. And that solution presented us with several new opportunities as well: 1) we could use their system to return to our usual 2 hosts + a guest format, 2) we could also use the system to have listeners call in as well as the guest. Seemed like a great opportunity. Further, there's not even any indication of what the audio levels actually are, so the people calling in can, perhaps, adjust the volume on their end with any accuracy. So, every week the audio level of the show is a guessing game on my part. Linda recently upgraded her phone capability (so it now pretty much matches mine), -- yet, my audio is still louder and/or "brighter." Why? We haven't figured it out yet. Maybe it's my church-bred speaking voice. People have suggested moving my mic further from my mouth. But it's on a fixed, inflexible pivoting arm (not bendable), and I've raised it up to the level of my eyes; apparently didn't help. Next: change the mic-in level on my computer (I'm using MagicJack to call in) -- I've pushed the level down almost to nothing; apparently didn't help. So, what to do? Well, it'd be easiest if BTR would upgrade their switchboard to include some basic mixing levels -- but who knows if they'll do that. I could try putting a small windscreen over my mic, if I can find/buy/improvise one. (That's probably worth a try.) Or I can go back into the studio at WBSD and use the tried & true methods. But that still leaves us with the problem of 2 hosts + 1 guest can only use one call-in line. And the weather precludes Linda coming in. I'll take suggestions, but you should realize that I'm pretty good at this stuff (not perfect), and I've already tried every solution that quickly sprang to mind -- and a few that required some pretty deep thinking. I could go in and manually fix all the audio levels for the show in post-production -- but that would take literally hours, and nobody is paying me to do it. Frankly, I can't afford to put in a lot more free time on this show. So, until we can solve this problem -- and we'll continue to work on it -- you have to ask yourself: Is Uncanny Radio worth having even with curent audio flaws, or would you rather not have the show in its current format at all? Friend of the show Robert Damon Schneck returns for our second-to-last show of 2008. This time around, he's chatting with Manwolf and Linda about Ouija Boards. Are they merely a harmless "fortune telling game," or are they something more sinister? Do people influence the boards, or do the boards influence people? Tune in and hear soem remarkable Ouija board stories collected by Robert for an upcoming book. This is another "internet show" recorded using the software of BlogTalkRadio. Check our page there for upcoming "live" broadcasts dates and times. Or listen to Uncanny Radio 037 here. As you all probably know by now, our own Linda Godfrey is the guest on back-to-back Uncanny Radio shows -- shows 035 and 036. In the first show, Linda Talks about her work on Strange Wisconsin and Weird Wisconsin. In the second show, Manwolf and Linda talk about ghost towns, plus manbat and other things with wings. You can hear show 035 here. And show 036 -- which was recorded live on BTR 12/5/08 -- here. Share the excitement as Steve & Linda try to solve the tricks of working in this new format. Listen in awe as Steve talks about audio drop-outs that were apparently only in his headset! Hear Linda forget that the intro to her segment is (now) recorded, and think that Steve is deliberately hogging the airwaves! And are those EVPs, ghost voices, or just some murmuring quirk of the new system? Stay tuned to find out! Seriously, there are a few more gaffes in episode 36 than usual, but look on the bright side -- in the future, you may be able to call in and talk to Steve & Linda and their guests live! Let us know how you like the experiment. Uncanny Radio 036 - with Callers! The show will be recorded live on Blog Talk Radio and then rebroadcast over WBSD the following week. The recording starts on Friday, December 5th, at 1pm, Central Time. Tune in early and bring your best telephone manners. Talk to you soon! To let both our listeners and ourselves catch up after Thanksgiving, we'll be replaying last week's interview with my co-host, Linda Godfrey, tonight over the air (and streaming). You can catch that show right now on Blog Talk Radio -- and stay tuned for a special, live call in show on BTR later this week. (Probably on Friday around the middle of the day.) Talk to you soon! I just put two reviews of UFOs Over Earth up on Howls & Growls and my blog. I like the show quite a lot, and if you've got it on your DVR, you should make sure to check it out. If you didn't see it or pre-record it, keep an eye out for reruns -- especially of the Mexico episode. Since last night's BTR broadcast went well, I decided to re-schedule the 'cast of show 001 that got screwed up. So, for those of you interested in Uncanny Radio's beginnings, or those of you who are Stan! fans, or those interested to hear what a "remixed" show (new music) will sound like, you can tune in momentarily and hear it "live" -- or check out the podcast/download later. I will be attempting to put up previous shows as I can, though it may be a while, since each show will have to be re-cut to include current music cues. Here's a link to the show. In the future, we hope to have links to the podcast available here and at the Uncanny Radio site. Stay tuned. Here's a direct link to the Bob Show. After the show broadcasts/podcasts live, it should be available in the archive as well. And will hopefully stay there for as long as we want. That's assuming I've done everything right. Tune in and let me know if it worked. If it works, our new segment - featuring Bob Beutlich -- should air next Wednesday night, 11-19-08 at 10pm central time (and then be archived automatically). With luck, we'll even have the podcasts available on iTunes soon. Stay tuned, and wish us luck! Until then, to tide you over, (by popular request) I'm reposting the first Khat Hansen show. If things go as expected -- and God knows they haven't for this show lately -- Brad Steiger should rebroadcast this Wednesday, and then we'll be back with some new live shows after that. I met a couple of potential guests at the Vortex Conference, and hopefully we can get our schedules to mesh soon. So, Linda and I are too busy to do a live show this week, and almost too busy to get the rerun show we want -- Brad Steiger -- on the air. At the last minute, I manage to rush into the studio and get the show into the computer. And then, another in a series of recent set backs happens: the studio computer refuses to send the show up to go on the air. After a fruitless half hour, I give up. The station engineers are going to have to fix this problem. So, right now, if you're listening streaming, you're probably hearing Khat 2 -- which may be good since hearing that show has been problematic. But Linda and I apologize anyway, though it's hardly our fault. The snakes seem to be biting right now. Put a review of the BVC up on my blog: stephendsullivan.blogspot.com. Find out how our experiences matched up. Or find out what you missed. Interested in a video? Space for comments, too -- as always. Heads up! This coming weekend -- October 31 (Halloween!) through November 2 -- I will be attending the Burlington Vortex Conference in Burlington, Wisconsin. The conference is a fun-filled weekend of famous and interesting speakers, get-togethers, and spooky tours on many topics familiar to listeners of Uncanny Radio. There are some very cool guests and events planned. I'll be there selling and signing books, hanging out, chatting with friends and fans, and maybe help Mary Sutherland (Uncanny Radio guest and owner of the SciFi cafe) record all the cool presentations she's got lined up. I can't tell you exactly where I'll be at what time, but I'll be wearing my Uncanny Radio t-shirt, and if you've checked my sites you probably have some idea of what I look like. Linda and Steve are wrapped up in Halloween-type appearances and other stuff. Because of that, and the ongoing SNAFU with the Khat 2 broadcast, we've decided to do reruns for the next two weeks. October 29, Replay of the Khat 2 broadcast that was preempted last week. Hopefully, this time our fans who like streaming can catch up with it. November 5, replay of our great, early interview with Brad Steiger. If you haven't heard this, you should do yourself a favor. We'll be back on November 12, with new shows, and probably a review or two of the Vortex Conference as well. My friend David's sister-in-law is going through a terrible time in the Philippines. The short version is that her newborn baby went through a month of ICU care before dying, leaving the grieving parents with huge medical bills plus funeral expenses, and now the hospital won't release the baby's body until the bills are paid. You can read the longer version of the story on my blog by clicking this sentence. Or you can see it on my home page www.stephendsullivan.com. Or paste the URL below if the link doesn't work. I want to stress that these are REAL PEOPLE whom I know. This is _not_ just another internet rumor. The tragedy is real and the need immediate. If many people can help in a small way, perhaps together we can ease the burden on the grieving parents. Please pass the information along to those who might help. Well, one of our listeners reported that our rebroadcast of the Khat show tonight was actually preempted by a live sports broadcast. It would have been nice if the station had mentioned that -- another in a series of recent tough breaks for UR. Additionally, though ZShare is up, our files (at least the recent one's I've checked) still seem to be down. They haven't responded to my emails about this. So, the only quick and easy solution I could come up with was to repost the show. You can listen to it on the link below, though it should be active in the podcasts list and the old description as well. Listen to Khat Hansen 2 RELOADED. ZShare seems to be back, but the podcasts aren't working. I'm hoping this will be resolved in the next day or so, but we have no leverage about it and nothing we can really do. It's not only our stuff, but their whole site. We will rebroadcast the show on Wednesday, 10/22/08, and hopefully the live streaming will work there. Sorry for the continuing trouble. We hope it will be resolved soon. Apparently, zShare, the site that hosts our podcasts is currently down because of technical difficulties. At this moment, we have no idea what caused this, how long this will last, or if it will affect any of our library of shows. We hope not! Recently, the zShare site underwent an upgrade which made it easier to use. I wonder if perhaps some bug snuck into the programing at that time. Sadly, there's nothing Linda or I (Steve) can do about this at the moment. Our only suggestion is to check back in the next day or so and see if it has returned. Crossing your fingers couldn't hurt, either. The second week of interviews with Khat Hansen takes another look at her frightening encounter with the manwolf (not Steve), what such creatures are, and where they come from. We also talk about "things with wings" including thunderbirds, mothmen, and other strange creatures. Once more Khat entertains with her colorful stories drawn from her Choctaw heritage. Check the listing below on the October 8th show for more info on Khat. Listen to the podcast of Uncanny Radio 033. Win one of five free day passes worth $55 each to the conference Oct. 31-Nov. 2 -- GO HERE for details on conference. Please enter only once per person. Each entry must be mailed separately. Uncanny Radio, P.O. Box 702, Elkhorn WI 53121. The first five received with correct answers will win. Be sure to include contact info so we can let you know you won, preferably e-mail or a self-addressed, stamped envelope for snail mail. Tickets will be picked up at the conference. 1. What free online novel did Steve "Manwolf" Sullivan write live during the 2008 Olympics? 2. Which book of Linda Godfrey's features a red cover? 3. Who was the guest on Uncanny's very first show? Khat Hansen is an American Choctaw medicine woman or "soul eater,", an archaeologist with a degree in anthropology, and a designated teller of tribal stories. At the age of 12, she had a terrifying encounter with a vicious Manwolf in Oregon that has colored her life interests and choices ever since. She has also witnessed Bigfoot, or Shampe in Choctaw, and explains that there are several different types and describes their appearance, behavior and origins. She shares insights and stories not usually available to the public, and gives an eyewitness account that will leave listeners white-knuckled. We're talking underground tunnels & vortexes. Mary Sutherland, owner and operator of Burlington Wisconsin's Sci-Fi Cafe and Earth Mysteries Museum, has been delving into the mysteries of the underground tunnel system that pervades the U.S., as well as the properties and functions of vortexes, time/space distortions that some believe are entrances to other dimensions. She believes the two phenomena are connected, and is sponsoring a Vortex Conference this Halloween weekend (2008) with a raft of noted speakers and local vortex and haunted woods tours. Learn what's right beneath our feet, and what may lurk there. Here's the Webcast. Marie D. Jones makes a fascinating return trip to Uncanny Radio with her new book, 2013: Envisioning the world after the events of 2012. After a fascinating overview of the Mayan, Cayce and other prophecies that have the world on a countdown to 2012, Marie Jones brings in a round-up of thoughtful speculation of whether the year will truly end the world...or fizzle in a Y2K-like anticlimax. How will things be better - or worse - and how can we prepare? Marie is also the author of Psi-Science and Super-Volcano: the Catatostrophic Event that Changed the Course of Human History. See more about these and upcoming titles at mariedjones.com. Listen to her Web Cast. Listen to the free webcast of Show 030 Marie D. Jones 2013. You just heard author and artist Bart Nunnelly discuss his new forthcoming book, "Inhumanoids." 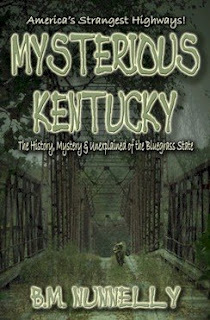 Now take time to revisit Bart's first Uncanny Radio broadcast on the topic of his first book, Mysterious Kentucky - a tome of interest to seekers of the strange from every state and country. .Nunnellywas born and raised in Kentucky, where he spent decades searching the bottom lands of the Bluegrass State for evidence of its unsolved mysteries. His wanderings have brought him face to face with such creatures as Bigfoot, water monsters, black panthers, out of place wolves and other mysterious cryptids including a Thunderbird in 1998 - something no other living researcher can presently claim. He currently resides in Henderson, Kentucky. Dennis talks about the secret meanings and uses of traditional Dutch hex signs and related issues. No, those Pennsylvania Dutch hex signs you see on barns and homes are not just pretty pictures. Used for healing and other magical purposes in a way akin to native Shamanic practices worldwide, the images and symbols of hex signs date back to prehistoric Germanic tribes. The spiritual use of hex signs is part of Dennis Boyer's family heritage, and he is an active practitioner himself. Listen as he shares inside knowledge from his books, "Once Upon a Hex," that most modern Pennsylvania Dutch folk won't admit. Dennis Boyer has also written the following books : Driftless Spirits --Ghosts of Southwest Wisconsin Giants in the land -- Legends and Folktales of Wisconsin Northern Frights -- A Supernatural Ecology of the Wisconsin Headwaters Great Wisconsin Taverns Prairie Whistles -- Tales of Midwest Railroading Gone Missing -- A Supernatural Tour of the Great lakes Snow on the Rails -- Short Stories of Heartland Railroading. He also co-edited with Justin Isherwood, A Place to Which We Belong, an anthology of land use essays. He is a frequent presenter and speaker at paranormal conferences, historical societies, community organizations, association conventions, and on public radio. When he is not traveling the Spirit Path, he lives with his family on a farm in Iowa County, Wisconsin. Visit his Web site OnceUponaHex.com. Listen to UncannyRadio Dennis Boyer Web Cast. "Inhumanoids," the new book by B.M. Nunnelly on the increasing variety of man-beast sightings worldwide. Early Podcast - Don't Forget Nick! As you can see below, we've put up next week's show early, due to the timely nature of it's information about exactly what went on in some phases of the GA Bigfoot Hoax. Linda and I are sure you'll all enjoy that, but don't forget to check out the Nick Redfern interview, which is this week's regularly scheduled show. Nick, as always, is a great guest. And don't forget to leave us comments and feedback on both. Enjoy! Radio host and investigator Johnson, a field associate of Tom Biscardi, talked to Uncanny Radio from the site of the Indiana location where the alleged "body" had been taken to thaw, with only about a foot of ice left. JC disclosed the horrendous animal parts found inside the Sasquatch costume and even in the rubber foot, and answered questions about the asserted measurements of the "creature" and other puzzling aspects of the case. Johnson is normally on field duty investigating creature incidents in the Western US, see the "Foursquare" Web site for more information and videos. Listen to the GA Bigfoot podcast. "There's Something in the Woods" with Nick Redfern. Texas-based British author and gonzo researcher Nick Redfern is one of those rare creatures; a researcher of cryptids who actually goes out in the field. His most recent book, "There's Something in the Woods," is the chronicle of his spine-tingling adventures in Great Britain and the U.S., and his show tonight will reveal secrets of crop-circle makers as well as discussion about his attempts to go where the monsters are, and what the true nature of many cryptid animals might be. Join us on this bi-continental quest for answers! 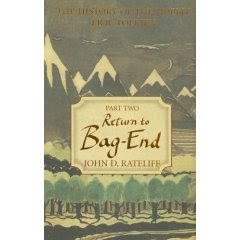 Redfern is the author of numerous books, including Three Men Seeking Monsters, Memoirs of a Monster Hunter, Body Snatchers in the Desert and more. See all his books at nickredfern.com. Check out Nick's cryptoblog, There's Something in the Woods, and see the list of archived webcasts above for other Uncanny Radio interviews with Nick. Podcast of Nick's August 20, 2008 show. Some brief notes on Tournament of Death, now that the competition has actually started. I've got live updates of my work on the project going on at Twitter – a cool site that allows you to get glimpses of the lives of your friends and interesting folks/projects — and am posting under the moniker "sdsullivan." Sign up, add me to your watch list, and check it out. You can see what part of the Olympics I'm watching and maybe deduce how it's working into my writing. I'm having a great time creating characters for the tournament and using them to reveal information about the setting and world of TOD. The story is set in the Blue Kingdoms, BTW, which some of you may be familiar with. To that end, I decided to label each character in the story when they have their own section or chapter — such as "Human Knight" or "Al Qiist Magician." An easy and fun way to learn about the world, I hope. And now is a great time to suggest characters you'd like to see created (or killed). I hope to get another poll up on the TOD site today, too. Did you vote in the one that's up now? It's summer and everyone is headed "up north." But if the hordes of tourists knew what the locals do about those dark woods and streams and Great Lakes shores, they might think twice about pitching their tent in a wilderness forest. Washburn Wisconsin writer, historian and filmmaker Tony Woiak discusses some of the creepy things to be found near Lake Superior on this edition of Uncanny Radio. The author of ten books on Midwestern and northern Wisconsin history, Woiak is currently making a film called I Was a Middle-Aged Zombie. He has contributed to Weird Wisconsin and Strange Wisconsin, and his parents were Manwolf witnesses. Robert Damon Schneck, one of our favorite guests. returns with a new show and then a remastered version of an old favorite. First up, on July 23, he talks to Manwolf and Linda about Jeane Dixon, psychic to presidents and stars. Find out about Jeanne's uncanny history -- and how much of it is really true. Then, on a classic Uncanny Radio (show 005 - remastered for better clarity) airing July 30, 2008, enjoy a smattering of Robert's best stories, including one about a poltergeist that converted to Catholicism, Pedro the Mummified Tiny Person, an electric machine intended to be God, a US president's connection to a vampire ... and perhaps Bram Stoker, and a Wisconsin tale so creepy that it defies description. Can you figure out the horrible "curse" that caused the first recording of this show to be "accidentally" wiped out by station engineers? Robert Damon Schneck, America's Historian of the Strange, is the author of The President's Vampire, Strange-but-True Tales of the United States of America -- Anomalist Books 2005, Barnes & Noble 2007 -- as well as several books for young readers including Detective Notebook: Are You Psychic? He is freelance writer who contributes to Fate the Fortean Times and other magazines. Robert has carried out parapsychology experiments, participated in ghost hunts and visited odd places in search of stories. He lives in Brooklyn, New York, in an apartment full of books and silverfish eating the books. Friends describe him as a lovable, nocturnal, monomaniac. Jeane Dixon Photo Courtesy of D.R. Shoop Photography, copyright 2008. Program Note: During the 7/23 show, Steve mentions "Kreskin" as making outrageous predictions, none of which ever came true. In fact, the fake psychic Steve meant to name was Criswell. Kreskin, of course, is a justifiably famous mentalist and performer. Criswell was a "psychic" known both for his wild (and inaccurate) predictions and for his association with infamous film director Ed Wood. This mentalist mix-up explains why Manwolf's comment comparing Kreskin with Jeane Dixon met with resounding silence from both Steve's co-host and Robert. Sorry, Mr. Kreskin! Over the last week, I've been working behind the scenes to give my main site www.stephendsullivan.com a complete make-over, changing it to a more dynamic and easily updated site -- more like my blog, the Uncanny Radio blog, or Howls & Growls. The switch-over should take place fairly soon, though it will take a while for me to import all of the content from the old site (book links, interviews, etc.) to the new one. Keep checking back on my existing blogs for updates. Or why not subscribe to the blog feeds? It's easy. Just follow the subscription link on the blog page! That way, you'll be able to get all my ongoing news without looking for it. Werewolf of Chicago - Or Holy Hill? 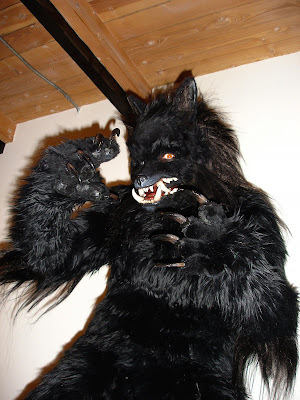 I met this cool woman with a home-made werewolf costume at WizardWorld Chicago a few weeks back, and -- with the bearwolf interview this week -- this seemed a good time to share a picture or two. If you drop Melly -- the artist -- a line, let her know you heard about her and her work on the Uncanny Radio blog! And be sure to tune in this week -- either live, streaming, or on the podcast -- to hear about the amazing sighting of the "bearwolf" by Steve Krueger. See the post about the Holy Hill sighting below. 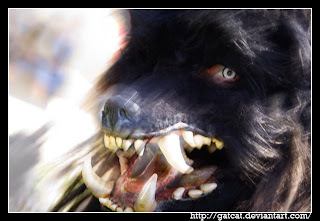 "Bearwolf" witness Steve Kreuger talks to Manwolf and Linda about his famous creature sighting near Holy Hill in Wisconsin. What did the creature look like? What actions did he take when he saw it? What was the police response? Krueger details all these things, plus a second strange sighting as well. Krueger becomes Uncanny Radio's first "witness" guest, as well as their second in-studio interview. Krueger is a nationally syndicated "fishing and hunting" cartoonist with "Moose Lake." At the time of his encounter, he contracted with the Wisconsin DNR as a deer carcass remover. Our radio interview with him was filmed by a crew from the History Channel as we taped it, for airing next spring in a TV special on werewolves. Be sure to catch this treat! Jim Grapek, president and founder of Associated Producers, Inc., a full service multi-media production company, is an award-winning documentary filmmaker. Grapek has overseen the production of hundreds of diversified programs for business, government and broadcaster, and has most recently specialized in the health arena. Grapek also wrote, produced and directed the first martial arts program to ever air on the Discovery Channel. The highly rated "Secrets of the Warrior's Power" was hailed by Black Belt magazine as one of the best documentaries on Chinese Kung Fu ever produced. Grapek decided to become a producer ­ to create positive programs that could make a difference in people¹s lives. After a successful transition into the industry, including a year spent as president of the International Television Association in Washington, DC, Grapek finally opened his own company, Associated Producers, Inc. in 1986, to fulfill his dream. Since then, through his work and his affiliation with the National Press Club, Grapek has been privy to spend time with, film, and glean wisdom from many of today's great luminaries ­ people spanning a wide range of perspectives, and far too many to list. They include such people as Oliver Stone and Robert Redford, Margaret Thatcher and many political leaders, world class scientists such as Drs. William Tiller, John Haglin, Russell Targ and David Peat, religious leaders from here and abroad, new age visionary thinkers such as Deepak Chopra, Greg Bradon, Dr. John Mack and Zecharia Sitchin, and many leaders in the fields of healing and conventional as well as complimentary medicines. Jim's website ­ which includes information on the upcoming IMAX film, is www.associatedproducer.com. Jim can be reached at jgrapek@earthlink.net . Click on this link for the podcastof this Uncanny radio show. Ghost Writer, Investigator, & Demonologist, Paul Dale Roberts served in the US Army from 1973 to 1976 working with C.I.D. (Criminal Investigation Division), D.S.T. (Drug Suppression Team). From 1979 to 1986 he re-enlisted in the US Army, but this time with Military Intelligence as an Intelligence Analyst with the Photo Interpretation Center in Seoul, Korea. Later Paul became an OPFOR (Opposing Forces) Soviet Threat Instructor teaching elite troops like the Navy Seals, Army`s Special Forces, Army`s Airborne Rangers on how to use a variety of Soviet made weapons. Paul has also been involved with the entertainment industry as a professional dancer and doing dancing appearances in movies and commercials during the 70s and 80s. Paul is now involved in the promoting of aspiring writers and artists who are trying to break into animation and comic books through his website Jazma Online! In fact his 1996 comic book The Legendary Dark Silhouette is being prepared to be made into a movie by independent movie producer Howard Nash. The first internet ad for the movie can be seen here. Paul is a freelance writer and has written travel articles, comic book reviews, and paranormal stories on ghosts and UFOs. Paul was recently a guest on the X-Zone, a Canadian paranormal radio show, discussing the connection between Military Intelligence and UFOs. The new podcast featuring Edward Readicker-Henderson is up in the podcast links at left. I think our audience will be interested in his views on ghosts, bigfoot, elves, and the Loch Ness Monster -- among other things. Just as a reminder, the free service we use for podcasts only keeps the shows up if they continue to be downloaded. So, please check out the early shows and others you may have missed, just to help us keep them online. We know that the audio quality of the earliest shows isn't as good as the current ones (I've learned a lot about running the studio equipment since then), but they still have some great material and we're sure our audience will enjoy them. Keep the comments coming and thanks for all your support! Edward Readicker-Henderson is a frequent contributor to National Geographic Traveler, Sierra, and Art & Antiques; other publication credits include AARP: The Magazine, Budget Travel, and -- despite his polar fleece aesthetic -- Modern Bride. He believes in ghosts, bigfoot, and even elves, but not the Loch Ness monster. Listen to the show and find out why. In 2007 Best American Travel Writing honored Edward for "The Quietest Place on Earth," as well as "Uses for Dirty Underwear." In 2003, the book noted "Why You're Here Now," and the next year, he won a Lowell Thomas Award for "Under the Protection of the Cow Demon." He's also recipient of a Northern Lights Award, for the best magazine travel story on Canada, in 2007. U.S. Poet Laureate Rita Dove remarked that his reflective style was "like watching a particularly elegant sleight-of-hand." The compliment was especially apt, since Edward can also juggle five balls and eat fire. A book collecting his work, Under the Protection of the Cow Demon is available from Walkabout Publishing and Amazon.com. Dave Schumacher, Science & Technology Advisor for the Southern Wisconsin Paranormal Research Group is also head of the SWPRG¹s research wing known as the Anomalous Research Department. "As a result of my commitment to the field, I have investigated, researched, and documented hundreds of reports of ghosts and hauntings using a combined investigative and scientific approach. While with the Southern Wisconsin Paranormal Research Group, I developed and built the unique Direct Environmental Acquisition Data logging system (D.E.A.D.) to detect and record environmental changes that occur during paranormal activity. I have co-authored a book with Jennifer Lauer titled, Investigating the Haunted: ­ Ghost Hunting Taken to the Next Level. Jennifer Lauer, Founder & Executive Director of the Southern Wisconsin Paranormal Research Group says, "I founded the SWPRG in 1999 and today it is considered to be one of the most respected, credible, and knowledgeable paranormal research organizations in the country. I've been interested in ghosts and the paranormal for as long as I can remember. In 2007 I co-authored a book with Dave Schumacher entitled, Investigating the Haunted: ­ Ghost Hunting Taken to the Next Level. The group was also cast in a new paranormal movie entitled, Ghosts of Door County produced by Spot Productions and Practical Illusions Television. 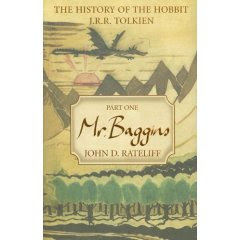 The movie is slated for a June 2008 release. Recently the SWPRG has been deemed the "Professionals in the field of Paranormal Research and Investigation" and are being featured in a new monthly segment on the "Daybreak Morning Show" on WTVO Channel 17 in Rockford, IL. More information on the Southern Wisconsin Paranormal Research Group can be found at www.SWPRG.com. Uncanny radio enjoyed having Jen & Dave in the studio so much, we postponed Howls & Growls this week so we could talk to them longer. Be sure to catch this fascinating, in-studio interview. If you've listened to our May 7 show, you know that Nick Redfern is just too much for one episode -- especially when he's talking about sea and lake monsters. Last time, we barely got past Loch Ness, and that's just one lake in Scotland! What to do? There seemed only one solution: have Nick back the next week to talk about all the stuff we didn't have time for in the previous show. That almost worked. Nick's stories about sea monsters (and hunting for sea and lake creatures), turned out to be so fascinating than even a second consecutive show couldn't contain all the cool stuff we wanted to talk about. So, I guess we'll have to have him back again soon. First, though, I think he deserves a couple of weeks off for performing above and beyond the Uncanny call of duty. Thanks, Nick! And, to the rest of you, be sure to leave comments on the blog and tell us how you like these shows. Enjoy! Uncanny Radio proudly presents a conversation with British (now Texas-based) author and former co-editor of Phenomena Magazine Nick Redfern . With summer coming it seemed a great time to talk about water monsters, and we begin by tossing around Nick's theories ... and experiences... at Loch Ness, Scotland. Is the Loch Ness monster, or Nessie as it is best known, a flesh and blood animal or some sort of spirit water guardian? Is it possible to "conjure up" a water monster? Nick discusses his attempt to do so, along with sorting out many other theories about the creature's possible origins. It was impossible to cover the entire topic in 40 minutes, so we will be having Nick back again very soon for Water Monsters Part II. Some of Nick's other books include Memoirs of a Monster Hunter, Body Snatchers in the Desert, and a new book coming out this summer titled "Something's in the Woods" based on his popular blog of the same name. In case you hadn't noticed, Uncanny Radio podcasts are now available in the links at left. Expect a new podcast every week, shortly after the show airs on WBSD FM. Let us know what you think! Take a trip on the Weird side with Uncanny Radio as we pick the eerie brains of Mark Moran of Weird US (in cap on right), who together with Mark Sceurman started the Weird New Jersey newsletter that morphed into the whole Weird series of books published by Barnes & Noble, the Weird US TV show on History Channel, a Weird US YouTube channel and much, much more. We will ask him about the ultimate Weird thing, his own experiences with Weirdness, and the best-kept Weird secret. A rare conversation with this man of many talents...not to be missed! Drop Linda or Manwolf a line -- or post a comment -- and let us know how it works. Our show with Nick Redfern went well last night. We hope you caught it live on WBSD or streaming. If you didn't, we hope to have podcasts available soon. And if you're interested, I'm doing a bit of blogging about producing the show on my own blog. And, of course, you can find more comments by me on Howls & Growls, too. Everything worked out, and our Nick Redfern interview should be on the air as planned from 8-9 PM Central time tonight, Wednesday, February 13, 2008. Listen live on www.wbsdfm.com -- tune in early and make sure your plug-ins are properly updated! (You may have to use Internet Explorer.) We hope to have podcasts of the first two shows available very shortly. The weather is dodgy and the studio is overbooked, but assuming everything works out, we've got a great guest lined up. Uncanny Radio proudly presents a conversation with British (now Texas-based) author and former co-editor of Phenomena Magazine Nick Redfern on our second show, February 13. We will be focusing on one of his latest books about an unidentified primate in Great Britain, Man Monkey. I would buy Man-Monkey: In Search of the British Bigfoot, for the title and charming British place names alone: Grubstreet, Cannock Chase, and Shugborough Hall. Sounds like a landscape straight out of Harry Potter. But the hairy, apelike creature that has haunted this part of the British Isles since 1879 is anything but kid-stuff. Sightings that included a giant "chimpanzee", a large and hairy, upright bear, a werewolf-like "Moon Beast" and more became the targets of Redfern's five-year, on-site investigation. In the course of his work, Redfern scrounged up forgotten old files, interviewed dozens of witnesses, and quaffed endless flasks of tea in his hunt for the truth about this furry fiend. Redfern examines explanations from the natural to the Fortean, allowing that the ancient myth of the shape-shifting Kelpie just may play a part in these strange appearances. Some of Nick's other ground-breaking books include Body Snatchers in the Desert, Three Men Seeking Monsters, Memoirs of a Monster Hunter, A Covert Agenda, The FBI Files, Strange Secrets and Cosmic Crashes. -- Check out our Guest List (at left) for more of our upcoming guests! One last special thanks (and his own post on the blog) to Stan Brown -- a.k.a. Stan! -- for helping us out and being our first guest amid last week's snowstorm "crisis." Stan did a great job, and if you didn't hear him live, we hope to have a podcast of the show up in the very near future. We also hope to have him back as a guest again very soon. Thanks, Stan! Despite the great Weather-Controlled Snowstorm conspiracy, Uncanny Radio made its premier Broadcast on February 6, 2008 from 8-9 PM (Central time). We'd like to thank our intrepid engineer, Dave, for braving the drifts to get the episode on the air. We owe you one, buddy! We'd also like to thank our special guest, Stan Brown (otherwise known as just Stan! ), who recorded this "special edition" show with us beforehand, just in case. Little did we know that we'd need that backup episode immediately! Thanks, Stan! Hopefully, those of you who couldn't catch the broadcast over the air heard it streaming on the internet over WBSD. A few people reported trouble streaming, and we now believe that to get the stream to work properly you may have to use Internet Explorer (and download a simple add-on). We're talking with the station about updating their streaming compatibilities, though we suspect this may be another conspiracy to keep UR out of the brainpans of eager listeners! For those of you who missed the premier, we're hoping to have a podcast available soon. Watch the Uncanny Radio blog for more info. Thanks for listening, and we hope you'll join us next week when our guest is British bigfoot hunter Nick Redfern. Stay tuned! Uncanny Radio: Snowed Out, or Not Snowed Out? Now's a great time to test your online streaming ability! Tune in to live streaming on www.wbsdfm.com from 8-9 tonight and see if the Special Emergency Edition of Uncanny Radio made it through the snow storm and onto the air. Manwolf and Linda don't know for sure, but even if UR is not on, you'll hear some fine Adult Alternative Album music on WBSD. And, with tonight's practice, you'll know what you have to do next week, when we go live! Remember to check www.uncannyradio.com (and its companion blog) for our upcoming guests and features! Linda and Steve (Manwolf) hope that the premier Uncanny Radio show will kickoff as planned tomorrow evening, Wednesday, February 6, 2008, from 8-9pm Central time. Well, we'll all just have to tune in and find out what happens. We didn't mean to generate this kind of suspense, but sometimes events intervene. WBSD -- www.wbsdfm.com -- streaming live. Thanks for your enthusiasm and support! Uncanny Radio's first live broadcast is on the schedule for February 6, 2008 -- from 8-9 PM (Central Time). Be sure to tune into WBSD radio -- or listen live via the web. With luck, Linda and Manwolf (Steve) will even be taking calls. Watch for more details and phone numbers soon. Welcome to the Uncanny Radio blog -- the official home of Manwolf and Linda (and the Uncanny World). Uncanny radio can be heard every Wednesday night (starting February 6, 2008) on WBSD -- or tune in via internet for live streaming. Just click on the "Listen Live" button. In the future, Manwolf and Linda will cover all aspects of the strange and uncanny -- from UFOs to the Loch Ness monster to Unicorns to Werewolves (naturally). Linda recently appeared on the American Werewolf episode of Monster Quest on the History Channel (January 23, 2008). Manwolf, in his guise as Stephen D. Sullivan, is the author of more than 30 books, including Zombies, Werewolves, & Unicorns available for purchase from Amazon.com or directly from Walkabout Publishing. Look her and on our companion blog Manwolf's Howls & Growls -- featuring Steve's, er . . . Manwolf's well-reasoned opinions on the current crop of supernatural TV shows (and other items of interest).